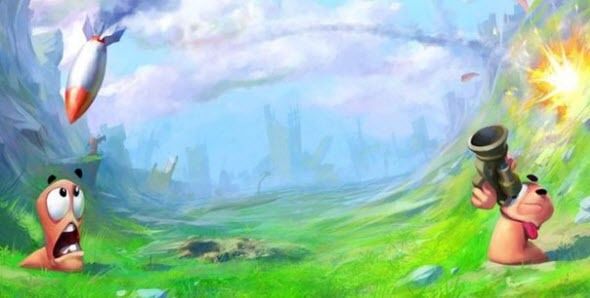 Classics is classics, and there are some game series, that can't be spoiled, especially if their developers worked at the next version of the game very hard and diligently. Worms Revolution - the last game of famous series, that has been popular all over the world since 1994, is a brilliant example of such classics in the game industry. From year to year Team17 has been trying to do this turn-based strategy more and more exciting, and in 2012 they made really revolutionary leap. 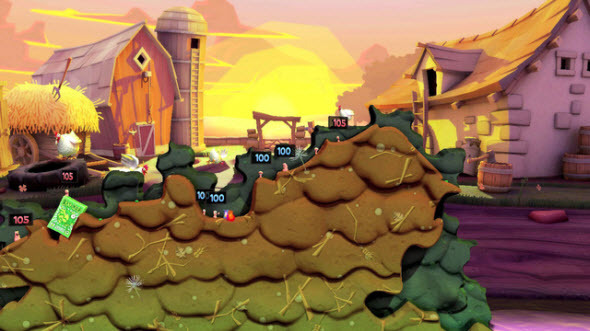 In Worms Revolution game we are observing the endless war between charming pink worms. These cartoon characters have adorable appearance, amazing voice and also very serious arsenal with a lot of weapons. The weapon is various - from bat to nuclear bomb. The task is simple - you need to control your team of worms and try to destroy every representative of all other teams. But Worms Revolution is not an action, here you need to think before act and be sure that your next movement won't kill your teammates together with the opponents. The enemies are playing in turn, so the best tactics is to corner your opponent trying to save your teammates. But the plot of the game was created in far 1994, and the main innovation of 2012 is the 3D-graphics. Frankly speaking, the design is 2.5D, so the gameplay is 2D as usual, but animated colorful background is three-dimensional. This concept is perfect, because the game looks bright and contemporary, but the graphics doesn't disturb you, so you are able to assess the map in a few seconds and successfully make your decision. The next environmental innovation touches the water, that from now is more than just a decoration. For example you can cause the big explosion near some lake or pool to free the water flow and wash your enemies away. Also you can push the opponent to the water and drown him after a few minutes, because worms are afraid of water, so at the bottom of lake they are losing their health and can't move as quickly as usually. The water was designed gracefully, it moves and sparkles. Also the water obeys the laws of physics, so it will be easy for you to understand how to turn the nature in your personal weapon. Also from Worms Revolution the characters in the game can be divided into classes, so now you can gather different heroes with various abilities in your team and so create really invincible detachment. In the game we have four classes: Soldier, Scientist, Heavy and Scout. 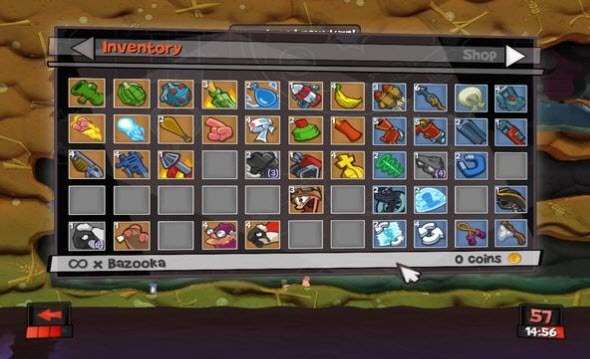 The worms from different classes differ by appearance and of course they have various skills. Soldier is the most popular worm, that is fast, agile and also has good fighting skills. Scientist is weak, but it has healing abilities, so it is perfect to have one clever worm in your warlike team. Heavy is very big, powerful and slow - just like the real tank. It is hard to kill this type of worms, so it should stay in the defense line. Scout is very fast and artful, it can penetrate into the narrowest passages, so sometimes it is really required in the team. To be the winner in the Worms Revolution game, you need to combine various abilities of different classes' representatives. To have more fun, you can change the appearance of your team. 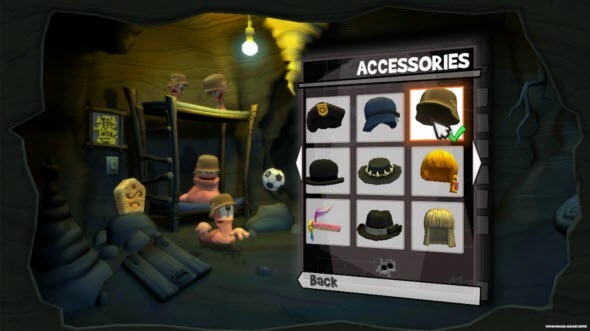 Now you can customize your worms, using hats, eye-glasses, moustache and different knick-knacks, so each your teammate can be stylish and elegant. The game has three various modes, so you may spend on it plenty of time. The single mode is the worst one because of too perfect AI. To win the battle sometimes you don't need to be clever and skillful, but lucky. The puzzle mode is much more interesting, and here you'll have to use your brains. And the most amazing mode is for multiplayer game, using which you can play with your friends locally or with the strangers from all over the world. 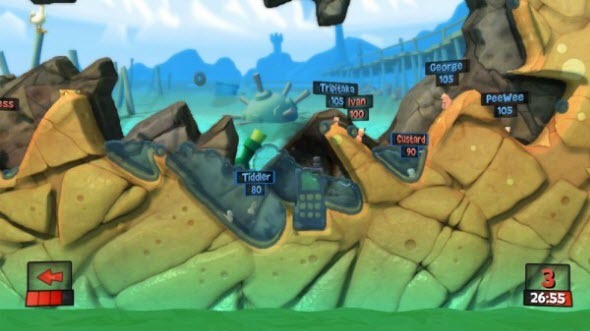 Worms Revolution game was created for gamers who play together, so if you really want to enjoy this strategy, use multiplayer mode.